1600 - The Hittite Empire forms in Turkey, also known as Anatolia. 1274 - The Hittites fight the Egyptian army under Ramesses II at the Battle of Kadesh. 1250 - Traditional date for the Trojan War which was fought in northwest Turkey. 1180 - The Hittite Empire collapses and divides into several smaller states. 1100 - The Greeks begin to settle along the Mediterranean coast of Turkey. 657 - Greek colonists establish the city of Byzantium. 546 - The Persians under the leadership of Cyrus the Great take over much of Anatolia. 334 - Alexander the Great conquers Anatolia on his way to conquering the Persian Empire. 130 - Anatolia becomes part of the Roman Empire. 47 - Saint Paul begins his ministry in Turkey, establishing Christian churches throughout the region. 330 - Constantine the Great establishes the new capital of the Roman Empire at the city of Byzantium. He names it Constantinople. 527 - Justinian I becomes Emperor of Byzantium. This is the golden age of the Byzantium Empire. 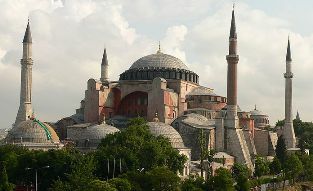 537 - The Hagia Sophia Cathedral is completed. 1071 - The Seljuk Turks defeat the Byzantium army at the Battle of Manzikert. The Turks gain control over much of Anatolia. 1299 - The Ottoman Empire is founded by Osman I. 1453 - The Ottomans conquer Constantinople bringing an end to the Byzantium Empire. 1520 - Suleiman the Magnificent becomes ruler of the Ottoman Empire. He expands the empire to include Turkey, much of the Middle East, Greece, and Hungary. 1568 - The first war between Russia and Turkey. There will be several other wars between the two called the Russo-Turkish wars between 1586 and 1878. 1569 - A great fire burns much of Constantinople. 1853 - The start of the Crimean War between Russia and an alliance of countries including the Ottoman Empire, France, and Britain. Russia is defeated in 1856. 1914 - World War I begins. The Ottoman Empire is allied with Germany. 1915 - The Battle of Gallipoli begins between the Ottomans and the Allies. The Ottomans win the battle pushing back the Allies. 1919 - World War I comes to an end. The Ottoman Empire is defeated. 1919 - Turkish military officer Mustafa Kemal Ataturk leads the Turkish War of Independence. 1923 - The Republic of Turkey is founded by Ataturk. He is named the first President of Turkey. 1923 - The capital city is moved to Ankara. 1924 - A new Turkish constitution is passed. Religious courts are replaced by government courts. 1925 - The fez hat is outlawed. 1928 - Islam was removed as the official state religion. 1929 - Women gained the right to vote and run for elected office. 1930 - The name of Constantinople is officially changed to Istanbul. 1938 - Turkish founding father Ataturk dies. 1939 - World War II begins. Turkey remains neutral. 1950 - The first open elections are held. 1952 - Turkey becomes a member of NATO. 1960 - The army stages a coup of the government. 1974 - Turkey invades Cyprus. 1974 - The Kurdistan Workers Party (PKK) is formed in an effort to gain independence for the Kurds from Turkey. 1980 - Another coup takes place and martial law is established for a period. 1982 - A new constitution is established and martial law ends. 1984 - The PKK begin a guerilla war in southeast Turkey. 1995 - The Turks attack the Kurds in northern Iraq. 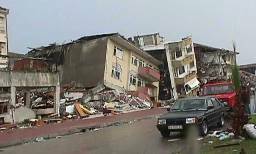 1999 - A 7.4 magnitude earthquake in Izmit, Turkey kills around 17,000 people. 2005 - Turkey begins negotiations in an effort to join the European Union. Turkey is located at the crossroads between Europe and Asia. This has made it an important land throughout world history. The city of Troy, made famous in Greek literature, was located on the Turkish coastline thousands of years ago. The first major empire to form in the land was the Hittite empire. The Hittites were followed by the Assyrians and then the Greeks, who began to settle in the area around 1100 BC. The Greeks founded many cities in the area including Byzantium, which would later be Constantinople and today is Istanbul. More empires came including the Persian Empire, Alexander the Great, and the Roman Empire. In 330, Byzantium became the new capital of the Roman Empire under Roman Emperor Constantine I. The city was renamed Constantinople. It became the capital of Byzantium for hundreds of years. In the 11th century, the Turks began to migrate into the land. The Arabs and the Seljuk Sultanate conquered much of the land. In the 13th century the Ottoman Empire emerged. It would become the most powerful empire in the area and rule for 700 years. After World War I, the Ottoman Empire collapsed. However, Turkish war hero Mustafa Kemal founded the Republic of Turkey in 1923. He became known as Ataturk, which means father of the Turks. After World War II, when the Soviet Union began to demand military bases in Turkey, the United States declared the Truman Doctrine. This was primarily meant to guarantee the security and independence of Turkey and Greece.